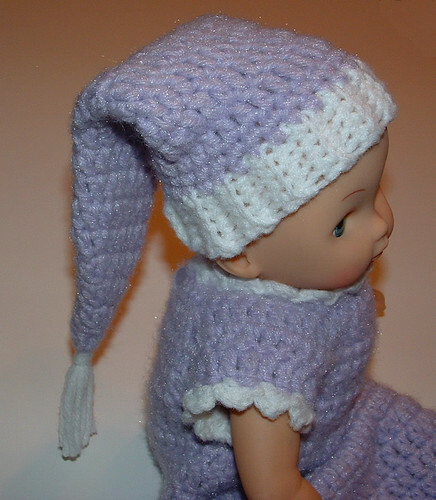 I designed this doll stocking cap as a sleeping cap for a baby doll. It fits a 12-13″ doll with a head circumference of 10-1/2 inches around. I wanted to share this quick crochet project as it’s a fun little hat to add to a baby doll clothing set. 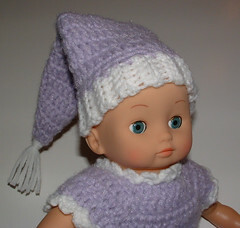 I crocheted this hat to go along with the doll bunting outfit I made for my granddaughter’s doll. 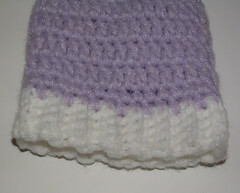 Using white yarn Ch 7. Ch 1, turn. Working in back loops only (BLO), Sc in ea st across to create ribbing. Ch 1, turn. Working in front loops only (FLO) of row 31 and into your beginning chain, work Sc through into both rows to join into a ring. Ribbing is about 1 inch wide. FO white yarn. Use a stitch marker if needed so you know where each round begins. Dc in ea st around. *Dc in next 3 sts, work 1 dec Dc over the next 2 sts. * Repeat between * around. Work 1 Dc dec over next 2 sts, Dc in next 5 sts, and work 1 Dc over next 2 sts. Dc in ea remaining sts of rnd. Dc in ea st. around. Work 1 Dc dec over next 2 sts, Dc in next 4 sts, and work 1 Dc dec over next 2 sts. Dc in ea remaining sts of rnd. Work 1 Dc dec over next 2 sts, Dc in the next 2 sts, and work 1 Dc dec over next 2 sts. Dc in ea remaining sts of rnd. Dc in ea st. Leave long tail of yarn to close end. FO. Cut 5 strands of white yarn 6 inches long. Attach tassel to end of hat through end st. 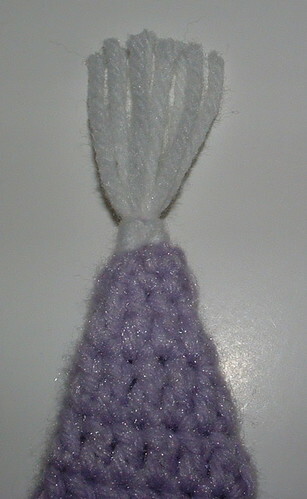 Trim tassel to make even.